The TK3 and TKS tankettes were the bulk of the Polish armored forces when war broke in September 1939. They were lightweight fast scout tanks. They were developed after a military delegation was invited at Rembertow (near Warsaw) to see the latest Vickers-Armstrong Carden-Loyd Mk.VI in action. They immediately bought the license to produce them locally, but with domestic modifications. The Polish design incorporated a newer, more flexible suspension, as the original one’s stiffness was very tiresome for the crew members. Development went along from 1929 to 1930 and ultimately the first true Polish tankette, the TK1 prototype, was delivered and widely tested, followed closely by the TK2. Both had an open roof and a single 7.92 mm (0.3 in) Hotchkiss wz.25 or wz.30 machine gun. They differed by the engine exhaust, location of the drive train and engine (a Ford Type A or Type T). Armor was slightly sloped and ranged from 4 to 7 mm (0.16-0.28 in), sufficient to stop or deflect 7.9 to 9 mm (0.3-0.35 in) caliber bullets. They were also slightly heavier and slower than the original Carden-Loyd tankette. By mid-1930, both TK prototypes successfully passed all tests at Modlin and the final, slightly simplified version was put into production at the Ursus company, near Warsaw. Production model TK3 passed all tests in June, 1931 and was officially commissioned. 300 of these machines were built by Panstwowe Zaklady Inzynierii (Ursus) until 1934. The engine was an imported Ford model A, the roof was closed and the frontal armor was up to 8 mm (0.31 in) thick. They were deployed in mechanized cavalry companies, able to tow ammunition carriages and various trailers to carry various payloads, including soldiers. Transport to the frontline was to be made by rail and using a custom-devised Ursus “autotransport” chassis, which was fitted under the tank and propelled by its own motor via an external transmission. A few of these were built. By June 1933, a prototype of a better protected TK3 with a different armor configuration was accepted for production and 290 of these improved tankettes were delivered from March 1934 until September 1939. In 1938, a TK3 prototype was given a Polish wz. 38 20 mm (0.79 in) high velocity antitank gun (only 20 converted). .
TKW: Many variants were studied until 1939, some testing a single-man rotating turret (TKW) with various armaments. The prototype was ready in 1933 and six were planned, but the entire project was cancelled in favor of the 4TP. TKD: The 1932 TKD was a specially designed 47 mm (1.85 in) self propelled gun of which only four were built, using the Polish 47 mm (1.85 in) Pocisk wz.25 gun. TKF: The 1934 TKF was equipped with a new, more powerful Polksi Fiat 122AB Motor. 22 were built, but the TKS series was favored instead. TKS-D: In 1937, two TKS-D were built as experimental tractors, but they could also carry the gun on the vehicle, as a sort of self-propelled guns. The intended armament was the high velocity wz.36 Bofors 37 mm (1.46 in) anti-tank gun. None of these projects entered production until the war broke out. The original design was just too cramped for other up-gunning attempts. With a total of 590 tanks, the TK family made up the bulk of the Polish armored forces. Although the TK3 was seen as obsolete, it was nevertheless thrown in action against both German and Soviet forces. Their German opponents were the Panzer II, many machine-gun armed Panzer Is, a handful of Panzer IIIs and many ex-Czech Panzer 35(t)s and 38(t)s, which all dominated the small Polish tankette. They also faced the Soviet T-26, T-28 and the BT family tanks. Most of them were attached to infantry units and cavalry brigades and some Polish tankettes were deployed in independent companies of 13 machines. They fought bravely, but hopelessly, achieving some success, most of it attributed to the 20 mm (0.79 in) armed TKS antitank brigade. Some of the captured tankettes were later used locally by the Germans for training purposes, as armored transports or to deal with Polish insurgents. A TK3 from a cavalry division, 1934 maneuvers. Note the operational markings and the early “Japanese style” camouflage. A cavalry division TK3, Kielce, September 1939. 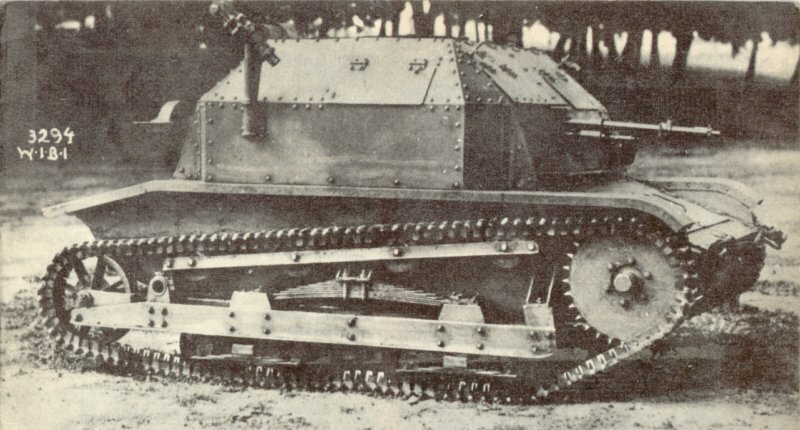 The TKW turreted tankette, sometimes improperly called TKW-1. The regular machine-gun of this turret version was the Vickers, replaced later by wz.25 or wz.30 machine-guns. The probably fictional TKW 2 was a supposed late conversion of the TK3 into an antitank version. Here a “what-if” reconstruction. The TKD was a lightweight, unprotected, self propelled gun conversion of the TK3, using the light 47 mm (1.85 in) SP Pocisk infantry gun or “bullet gun”, center-mounted, with its own shield. They served at Modlin for trials and from 1938 in the 10th Motorized Cavalry Brigade. They took part in the seizure of the Czech Zaolzie province and were lost near Warsaw in September 1939. TKS at the Polish Army museum. I want to say that TKW with 20 mm gun is a hoax. TKW’s turret was too small to contain this big weapon. 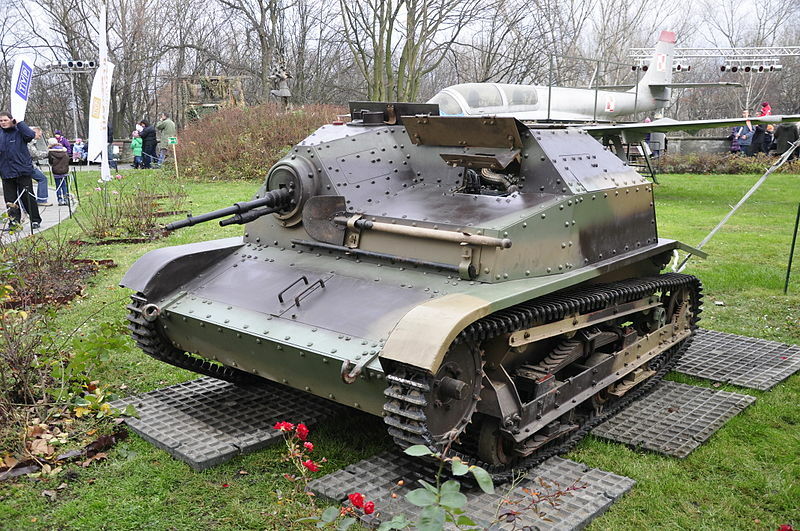 Polish army had no plan to place 20 mm gun i TKW – this tankette was only experimental vechicle. TKW with wz.38 rifle is probably a myth from model company RPM. Sorry for misprint – 20 mm gun in TKW*. Thanks for your insight, this would need more digging, but the illustration legend has been updated to “what-if”.